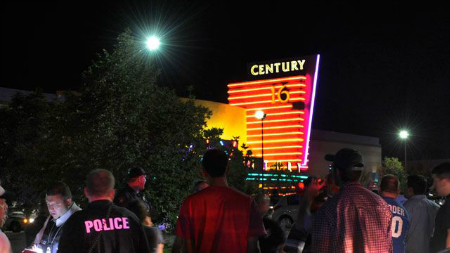 At least 12 people have been killed and up to 50 injured after a mass shooting at a showing of “The Dark Knight Rises” at a suburban Denver movie theater, police say. Police, ambulances and emergency crews swarmed on the Aurora, Colo., theater after frantic 911 calls around 12:30 a.m. local time, officials said. Holmes reportedly fired shots inside the theater and fled to the parking lot and was confronted by police already at the theater for crowd control. Holmes wore a bulletproof vest, police said, and was carrying a rifle and two handguns. The handguns may have been placed in the theater before the shooting. FBI spokesman Jason Pack said there’s no indication in the investigation so far of any connection to terrorism. President Obama said he is “shocked and saddened” by the mass shooting and urged the nation to “come together as one American family.” He said his administration will do everything it can to support the people of Aurora, Colo. The White House says Obama, who was in Florida at the time of the shooting, was informed of the shooting by Homeland Security Advisor John Brennan. James Wilburn was sitting in the second row of theater 9 after midnight when an emergency door opened and a man entered, the Denver Post reports. The man was carrying a shotgun and had a rifle strapped to his back, Wilburn said. The gunman then dropped a canister, causing a noxious gas to spew out. He raised the shotgun and repeatedly fired toward the back of the theater. Wilburn and three friends dove to the floor, hiding behind seats in front of them. The gunman was only five or six feet away, he said. Once the shotgun was empty, the gunman calmly dropped it to the floor, took the rifle and went on firing. Wilburn heard roughly 30 shots, the Denver Post reports. Meanwhile, 21-year-old Naya Thompson and her 22-year-old boyfriend Derrick Poage were running for their lives. Thompson said the gas spread and the gunman may have dropped two canisters. James Cameron, who was in an adjacent theater, said he heard commotion and screaming. People seated around him began coughing and having difficulty breathing. “By the sound of it, it sounds like there could have been three or four guys shooting,” he said. Audra Mincey, a spokeswoman for the Swedish Medical Center, told Fox News there are two patients in critical condition. Mincey said the hospital set up its incident command center and mobilized personnel. Police Chief Dan Oates said there’s no evidence of any other attackers. There was also no immediate word of any motive. Holmes spoke of “possible explosives in his residence. We are dealing with that potential threat,” Oates said. It was the worst mass shooting in the U.S. since the 2007 shooting on the Virginia Tech campus. Some moviegoers said they thought the attack was part of the show. Then they saw a silhouette of a person in the smoke at the front of the theater, pointing a gun at the crowd. “I told my friend, `We’ve got to get out of here,’ but then he shot people trying to go out the exits,” Jennifer Seeger told NBC’s “Today.” She the shooter made his way up the aisle, shooting as he went, saying nothing. The youngest victim reported was a 6-year-old being treated at Children’s Hospital Colorado, where a total of six victims were taken. Their condition wasn’t known. Aurora is on Denver’s east side and is Colorado’s third-largest city with 327,000 residents. It is home to a large Defense Department satellite intelligence operation at Buckley Air Force Base, as well as The Children’s Hospital, the University of Colorado Hospital and a future Veterans Affairs hospital.